Well, the summer movie season is over. No more huge-budget, low-intellect, action packed whiz-banging blockbusters until next May. We’re now going into the season where we get to see lots of movies that will make it onto the top ten lists, movies trying to earn their way onto the Oscar ballots. But before then, let's send Summer out with a bang! There were a LOT of sequels this summer. 15, to be exact. That’s a lot of sequels, but I think one stands above the rest as easily being the most satisfying summer sequel. The sequel that carries on the name of its predecessors in grand fashion and even managers to be better then a few of the ones that came before it. Live Free or Die Hard was definitely the most satisfying summer sequel. The action was extraordinary, the acting was great, and the plot was just good enough to make this a truly exemplary action movie. The only Die Hard better than this one is the original, and this comes close to being better than that one. 12 years off did good for this franchise. I didn’t have high-hopes for this movie, for a number of reasons. PG-13, teenage sidekick, etc. But when Bruce Willis first came on screen, yanking his daughter’s boyfriend off of her with a funny little quip to go with it, I knew this was going to be one of the best movies of the year. When the credits rolled, there was no doubt in my mind that this 07’s most satisfying summer sequel. I can’t believe I wasted money seeing this movie. Uugh....thinking about it gives me a headache. This is coming from a huge fan of the original Shrek. I love that movie, and I also enjoy the sequel. But this....this is total garbage. There’s some good moments, but they are absolutely eclipsed by a string of terrible jokes and an absolutely awful and derivative plot, that seemed like a really bad fan-fic. Mike Meyers hasn’t done a live action role since the first Shrek, and I wish he would. He has so much talent, but he’s wasting it with these voice roles. If it weren’t for Ratatouille this summer, I’d seriously think that everyone in the animation business was purposefully trying to destroy the animation genre. None. No other summer sequel came this close to being this bad. I really hated the original Fantastic Four. It was one of the worst super-hero movies I’ve ever seen. So as you can imagine, I wasn’t exactly looking forward to the sequel. But this one...was actually pretty good. The acting was better on all counts, the movie actually had a plot, and the final action scenes actually had some tension. This was a really fun movie that, while flawed, is easy to appreciate for what it is, and if the next Fantastic Four sequel shows as much improvement as this one did, then it will be a bona-fide masterpiece. This was a tough one. Out of the fifteen summer sequels, six of them were threequels, and I loved four of them. This was a close match between Pirates of the Carribbean 3, Ocean’s, and The Bourne Ultimatum, but I have to go with Ocean’s Thirteen. Not only did it completely redeem the misguided Ocean’s Twelve, it was one of the funnest movies of the summer. Just as clever as Ocean’s Eleven, this is a sequel that I absolutely loved, and, although it was close, the best threequel of the summer. 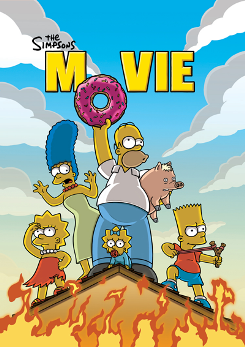 Anyway, The Simpsons Movie could have been a train wreck. The show has been awful in recent years, so this movie was a surprise. I loved every minute of it, and was completely satisfied with the film. Ten years from now, I can see this being regarded as a comedy classic. In a summer with so many high-budget, effects driven action films, this one easily nabs the special effects awards. In fact, I’d say Transformers sports the best special effects I’ve EVER seen in a movie. Saying it had realistic CGI isn’t a strong enough word. These things really looked REAL. I honestly thought that they were models or something because I didn’t think CGI could be this good. The robots looked completely real, as real as the actors or the sets. There was none of that digital faky-ness you get with Spider-Man; these things just looked spectacular.